Despite not being Canadian, Canada Day Resolutions used to be a thing here on PVD, since I often found myself reviewing my progress on my New Year's resolutions on a day that coincided with the Canadian national holiday. Last year I didn't cover Canada day due to being on summer vacation, and this year I was in the middle of an international move and didn't feel postured to write New Year's resolutions in January, but no need to let these details stand in the way of tradition. Through a combination of purchases, promotions, and in-game awards, I'm rapidly closing on unlocking every hero in the game. Thirteen sit at max level and another five have hit at least level 50 for their second tier synergies. Without specifically trying, this puts me over halfway to the game's current total level cap (2100 for the 35 current heroes at 60), and just shy of halfway when you include the eight announced characters (six remaining Advance Pack characters, Nova, and X-23 for a total of 2580). 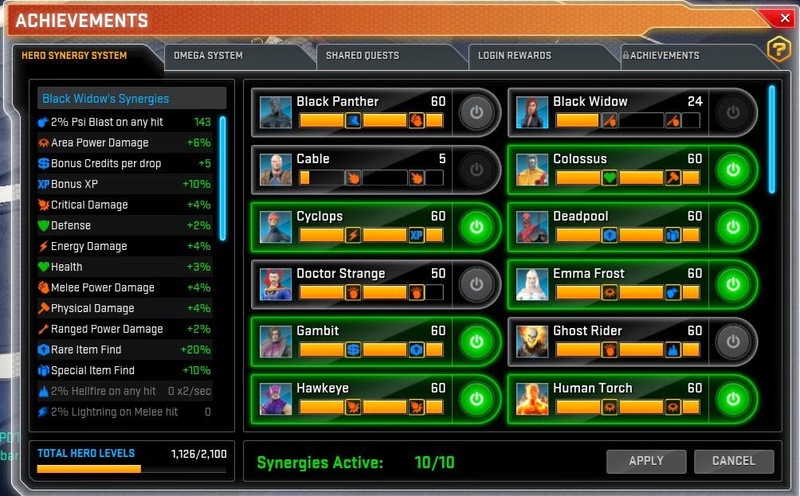 I'm hesitant to commit to this kind of goal for fear that I will get tired of it, and perhaps that's a fair concern, but clearly chain-leveling characters in Marvel Heroes has managed to hold my interest. Meanwhile, later characters are definitely getting easier due to steadily increasing amounts of bonuses as the game keeps adding new systems. We'll see how far I can get. My current roster: I can immediately purchase four of the seven greyed out portraits, as I currently have 1400 splinters. I will need 1000 more for the other three, plus 600 for Nova and X-23. Neverwinter - To 60 But Actually Playing? Level 30 in Neverwinter was enough of a headstart to get working on the several out-of-game minigames, similar to Star Trek Online's duty officer system. These are good fun, and it seems highly likely that I will hit the game's level cap through experience gained from these mini-games alone. A better, and unanswered, question is whether I will ever get back to playing the actual game, or just stick to the minigames as I did in STO. Not sure if that's good or bad feedback for Cryptic, but there you have it. I passed on the PS4 last year, in part because of looming move and in part because there wasn't much on the release calendar for the holidays that I couldn't just get for my existing PS3 instead. A year later, the math is flipped - many of the older PS3 games I had yet to beat are now available in re-mastered editions on the PS4, so it's only a few last hold-outs between me and retiring my PS3, possibly for the shiny white bundle with Destiny. The titles in question are the last few chapters of Uncharted 3 along with all of Infamous 2 (both of which I already own) and Batman: Arkham Origins (which I technically could purchase on the PC if push came to shove). I have a new set of multi-platform gaming headphones, so I'm feeling good about my odds. And then things are open ended. I own some prepaid time for SWTOR that I won't use until the next mini-expansion that has adventuring content (apologies to those who are eagerly awaiting the housing mini-expansion). Honestly, I'm more likely to jump on the Blizzard MOBA than the next WoW expansion, but I'll keep my eyes out for steep Black Friday discounts. I won't look at either TESO or Wildstar until they offer a free trial, and honestly neither is likely to make the cut with me as a subscription title. EQ2, Rift, TSW and the Turbine games also seem to be out by default. EQ2 has the best shot at a come-back, but since they went digital only their expansions are no longer available at a discount, and I'd need to buy an expansion to continue playing my character. FFXIV is a possible contender. I left that game with generally favorable impressions, but also feeling that I was starting to need more structured group content to advance. This would be a deal-killer with my schedule these days. Maybe in a patch or two, as I hear they are going to have ninjas. Could actually be a year where I do almost nothing in traditional MMO's? We'll see. Happy Canada Day, and/or best mid-year wishes as appropriate!